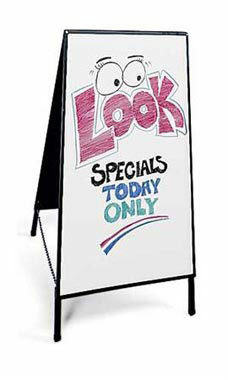 Draw attention with this Dry Erase Board A-Frame Sidewalk Sign that’s ideal for sidewalks or lobbies. Write and draw fully customizable ads and attract shoppers. This sign features back-to-back white, write-on/write-off panels. Each panel is 41”H x 21”W and held together on a sturdy metal frame with a black finish. The sign comes with 4 dry-erase markers (black, red, blue, and green) that instantly erase with a dry cloth. Exactly what I needed for my business perfect Size. Great way to advertise. And as always fast Shipping.